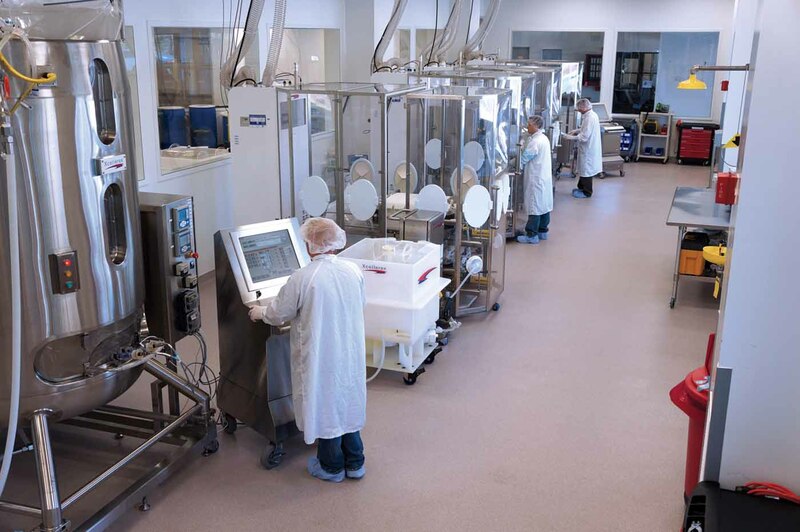 The biopharmaceutical industry now incorporates single-use (SU) technology and systems in most production processes based on cell culture (1, 2). Implementation of such technologies has led to the availability of prepackaged and sterilized systems complete and ready for use with preinstalled mixers and monitoring probes. From upstream process- material preparation through final-product formulation, biopharmaceutical sponsors are increasingly presented with numerous SU solutions that support all major production platforms (3–5). The number of SU materials and suppliers in biopharmaceutical manufacturing has mushroomed since SU systems (SUS) were introduced in the early 1990s. The result of this rapid growth is the commercial availability of many unique SU products, designs, and materials. In turn, such growth has introduced challenges in the establishment of secondary suppliers’ development of component construction, qualification, and validation protocols as well as in the amount of inventory to be maintained. The industry has seen significant activity in the standardization of practices. For example, the Bio-Process Systems Alliance (BPSA) and BioPhorum Operations Group (BPOG) are engaging with traditional standards organizations and test- method developers to ensure consistency of approach and content of many topics. Table 1 lists examples of areas directly affected by SU technologies along with the organizations involved (6, 7). This year the BPSA has released documents contributing to the standardization a couple of distinct topics. One is a white paper on particulates, harmonizing such topics as special terms, methods of testing and control, and approaches to characterization (8). Another is a consensus template placing a common structure to SU biopharmaceutical quality agreements, providing a guide in topics ranging from specific end-user needs to attributes of the suppliers quality systems (9). Due this fall is BPSA’s new and updated paper on component quality test matrices contains multiple test standard references, including a new section on chromatography. It provides quality test methods or standards to be applied to identified SU categories or life-cycle stages (10). BPOG and BPSA are continuing with collaboration toward establishment of a “consensus extractables agreement” as a standardized extractables testing and analysis protocol. Testing details include the number and type of solvents applied, the time and temperatures to be used, ratios of plastic surface area to solvent area volume, and matters related to analytics. The value of this particular standard is rarely debated: The standard includes topics such as alerting to the presence of known problematic compounds, contributing data to risk assessment tools, providing information for regulatory submissions, and generally aiding in relative SU materials selection. Many people have promoted the idea of standardization in general by exemplifying its success in other industries. For example, standardization facilitated process materials and technology incorporation in the semiconductor industry and, more relatedly, efficiency and economy in the membrane-filter industry. However, promoting the concept of “standardization” in the SU industry is problematic. Depending on the audience and context, there is often a distinct ambiguity in precisely what is being described. Although many authors and pundits have contributed to the issue, it appears that consistent definition of the topic is lacking. Individual aspects of the question include the specific object, purpose, and goals of standardization; the means and timing of its accomplishment; and its international scope and authority. Debate Issues: One area of debate is how the uniformity of particular elements of a topic should be established. For example, a general consensus could be developed as a recommendation to be stipulated as a requirement in individual contracts. It could be published as a more formalized guideline, guidance, or points-to-consider; or clear specifications could be established as a technical standard. One compromise under consideration is to have technical standards with nonmandatory appendices containing discussions on the current state of the art. Also, participants with different backgrounds have different ideas of what standardization might mean. Engineers often think of establishing a formal ASTM code or standard. Regulators may think of compliance with law, such as 21 CFR regarding in-process materials. And others may contemplate less formal best practices, guidelines, or benchmarks providing general guidance to individual specifications or contractual terms. Some ambiguity also exists in the literature over the ultimate reason to control such properties; some authors mention only manufacturing efficiency, and others address solely product and patient safety. Finally, questions exist regarding the scope of application with any of those issues. The benefits and concerns associated with standardization of SU bioreactors are quite different from those of 20-L transfer bags. Groups intimately involved in each standardization initiative understand their commission in many of the concerns above, but others (suppliers and users alike) seem often to have only vague impressions. A goal of SU standardization might relate to such physical parameters as dimensions and tolerances relevant to process design. In optimizing the form, fit, and function of individual components, more uniformity in container-connection technology and systems could be helpful (for example) to ensure connectivity among disparate operations. Some talk has focused on standardizing dimensions and tolerances of disposable component supplies within a particular unit operation, such as to establish the commoditization of SU mixing bags in a reusable housings. On the one hand, there can be a standardization of desirable properties of the films, tubings, and solid plastic components (Table 2). Or there can be interest in standardizing the specifications and testing methods for these properties. That can be established as a consensus of existing industry goals and techniques in attribute testing relevant to the selection and qualification of materials and devices. One example is the current BPSA–BPOG initiative to establish an industry-accepted set of testing methods for determining such material chemical characteristics as a film’s extractable and leachable profile. Or, such as standard could instead refer to establishment of applicable regulatory guidance or test methods themselves, such as the recent drive to establish an ASTM standard for such testing in fulfillment of CFR part 211.65. Two Sides: Standardization of dimensions and configurations (e.g., of tubings and connections in a distribution manifold) would provide many benefits. It would allow manufacturers to inventory large stocks of that type of product, providing for economies of scale in its manufacture. This would provide both reduced costs to consumers and increased margins to manufacturers. It would also greatly reduce the lead time between ordering and shipping. Having standard drawings for such parts would facilitate establishing second sources as well as shopping around for suppliers. It would also help smaller suppliers to participate in the SU material supply process. Finally, it would facilitate the incorporation of products up- and downstream from a diversity of suppliers because the connectivity would be predictable and uniform. But such standardization would come with a cost. It could have the effect of “freezing” technology at one point and stifling future innovation and improvements. If a supplier subsequently discovers a new or better dimension, that company would either face a great obstacle to overcome in getting purchasers to go with a nonstandard component, or it would have to change the standard. Similarly, standardization could slow supplier responses to technological development and process innovation feedback from biomanufacturing end users. Because most vendors would be stocking standard parts, fewer would have the capability of or interest in producing a novel or custom part to support an “improved” process. This is not only in reference to small, incremental improvements. 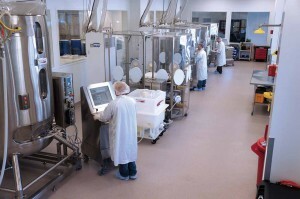 Recent interest in implementing continuous biomanufacturing technologies illustrates the dynamic nature of industry and manufacturing approaches as a whole. Both suppliers and end users have argued distinct elements on both sides of this issue. Some end users assert that standardization might restrict accommodation of legacy requirements or of novel process design. Some vendors declare that they would lose a competitive edge if they could not “customize” their assemblies. Another consideration is the initial cost of establishing a unified and coordinated documentation package for SU components. Such a process could be onerous to larger suppliers and nearly impossible for some smaller ones. On the other hand, end-user claims of standardization benefits include the possibility of lowering inventories and increasing manufacturing experience. It is alleged that standardization adds process transparency in an industry where users have been outsourcing many quality and regulatory activities to vendors. The benefit to vendors is asserted to be avoidance of frequent production set-up changes in what would then be stock items — for potentially reducing costs and creating the possibility of just-in-time deliveries from multiple vendors. Other Industries: In cataloging the virtues of standardization, proponents often invoke successes in other industries. Although there have been many such achievements, we should be cautious here for a number of reasons: One is that analogies to industries with business models, product types, and lifetimes quite divergent to those of the biopharmaceutical industry can mislead. Another is that although some industries have thrived under some early and universal standards, even here exceptions exist. On the other hand, the success of establishing objective standards in the membrane-filter equipment arena is pretty much universally acknowledged. Previously, filter dimensions and construction methods varied widely, membrane-pore measurements were local, and component materials greatly diverged. Many different filter cartridge dimensions and styles were available. That caused users to maintain large inventories of unique parts and to be concerned about using the wrong part in a particular, housing of similar appearance. Eventually, because of the pressures of economy and efficiency, the industry accepted standardization in dimensions and regulatory requirements. Table 3 shows the diversity of organizations interested and active in the establishment of standards in one or more areas. The table includes professional societies and standards bodies, test-method developing organizations, regulatory agencies, and national compendial monographs as well as regional and company-internal materials specifications (see “Sources”). Table 3: Examples of organizations involved in SU standards (nonexclusive). Regardless of the individual ambiguities and debates, progress has been made. The existing Component Quality Test Matrices from the BPSA Guidelines and Standards Committee has been well received as a guide in specifying the quality testing methods of different SU components (11). It is serving as a beginning for some other best practices and consensus guidelines. Most experts agree now that, for a number of reasons, it’s too early to standardize either the reusable instrumentation of SU bioreactors, mixers, and filling devices or the dimensions and porting of their disposable components. The same may be true for their component films as well. However, most also concur that some standardization could be currently achieved with process-fluid manipulation or product hold–storage bags (or even the multicomponent systems they support). Those items — which are now commonly designed as a custom product — very conceivably could be standardized with respect to such parameters as overall dimension, volume, tubing diameter/length, filter component specification, port dimension, and connector style. Benefits to that would include vendors reducing the extent of their operations and number of personnel as well as lead times and prices while increasing their quality and reliability. End users would gain through a reduction of inventory and process validation activity as well as by increased flexibility in vendor and secondary vendor selection. Beyond the SU system component materials issues currently addressed, other areas could potentially benefit from a BPSA/ BPOG–designed consensus (see “Standardization Topics” box). Regarding the scope and coverage of standards in many areas described above: Even if 80% of the material suppliers or entity sponsors needs can be satisfied, probably no perfect solution will be discovered. It has been said, “Recognize that there is not likely to be a ‘standard’ extractable protocol that will meet all the end-users’ needs” (12). On the other hand, some experts insist comprehensive standards of some sort are absolutely required for progression of the industry (13). Finally, for some SU products or activities, a third option exists. It’s clear that de novo customization is slow and expensive, and tight regulation can be stifling to process development and innovation. However, it may be possible to entertain a platform approach incorporating a baseline design with defined customization. Such an approach uses a product platform or set of common components, modules, or general designs from which a stream of highly related derivative products can be created. Here, a number of drawings (or assemblies of a defined level of completion) are previously designed or manufactured (14). A number of processes — referred to as top-down approaches — have been proposed for synthesizing platforms that facilitate the realization of a stream of customized product variants. Such assemblies accommodate many levels of commonality and multiple highly defined customizable specifications. product in a smart way to fit existing designs” (15). The challenge then would be to expand that approach to intersupplier platforms of basic parts, designs, and specified customizable options. 1 10th Annual Report and Survey of Biopharmaceutical Manufacturing Capacity and Production. BioPlan Associates, Inc: Rockville, MD, April 2013. 2 Whitford WG. Single-Use Systems As Principal Components in Bioproduction. BioProcess Int. 8(11) 2010: 34–42. 3 McLeod L. The Road to a Fully Disposable Protein Purification Process: Single-Use Systems Eliminate Time- Consuming, Nonrevenue-Generating Activities. BioProcess Int. 7(4) 2009: S4–S8. 4 Eibl R and Eibl D. Single-Use Technology in Biopharma Manufacturing. John Wiley: Somerset, NJ, 2011. 5 Lajmi AR, Nochumson S, Berges A. Impact of Antibody Aggregation on a Flow- Through Anion-Exchange Membrane Process. Biotechnol. Prog. 26(6) 2010: 1654–1661. 6 Rios M. Efforts Toward the Harmonization of Single-Use Standards; User Group Panel Presentations from 2013 BPI Conference. BioProcess Int. 12(4) 2014: S4–S11. 7 Martin J. Standardizing Practices for Disposables. BioPharm Int. 27(5) 2014: 16–18. 8 BPSA. Recommendations for Control, Testing, and Evaluation of Particulates in Single- Use Process Equipment, 2014. 9 BPSA. Consensus Quality Agreement Template for Single-Use Biopharmaceutical Manufacturing Products, 2014. 10 BPSA. Single-Use Manufacturing Component Quality Test Matrices (draft), 2014. 11 BPSA. Bioprocess System Alliance Component Quality Test Matrices. BioProcess Int. 5(4–5) 2007: S4–S11. 12 Wong K. Extractable Protocol Standardization Efforts for Disposable Systems from BPOG Working Group. BioPharma Asia January/February 2014. 13 Pralong A. Standards for Single-Use Technology: A Must for Success. BioPharma Asia, May/June 2014. 14 Hernandez G, Allen JK, Mistree F. Platform Design for Customizable Products As a Problem of Access in a Geometric Space Engineering Optimization 35(3) 2003. Corresponding William Whitford is a senior technical market manager at GE Healthcare Life Sciences; william.whitford@ge.com. Parrish Galiher is the CTO, Upstream, at GE Healthcare Life Sciences; parrish.galliher@ge.com.